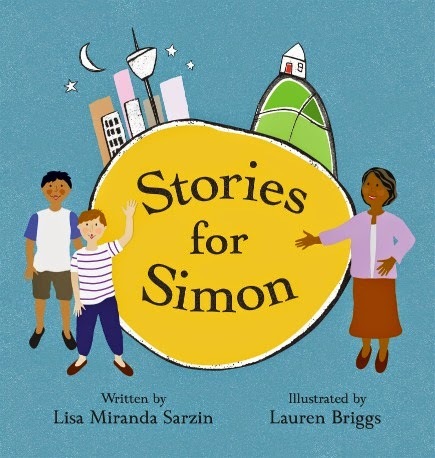 Stories for Simon is a children’s picture book written by Lisa Miranda Sarzin, illustrated by Lauren Briggs, and published by Random House Australia (2015.) RRP: $24.99. When Simon unwraps a beautiful boomerang wrapped in an old newspaper, he learns of the national apology to the Stolen Generations. Who were the Stolen Generations and how can saying ‘sorry' help? Through a new friendship and a magnificent collection of stories, Simon gains a deep appreciation of the past and a positive vision for the future. I also loved the strong element of graphic design that drives the illustrations. The colours are varied, often earthy, many patterns are reminiscent of indigenous culture without copying that style, and use is made of collage and texture. Briggs also doesn’t gloss over the facts, and her images support and enhance Sarzin’s text. Can you imagine what it would be like to be taken from your family and dumped with strangers? Can your kids imagine how lonely and scared they would be? I think it’s important for children and adults to understand about the Stolen Generations and why our Prime Minister thought it was important to say Sorry. If you agree, do seek out Stories for Simon. It’s a beautifully produced and sturdy edition that deserves a place in your home, school or library. There are Teacher Resources available at the Random House website.